She woke up with a scream. She could never remember her dreams, but her heart raced. The streetlights left her room glowing blue. The faces of her inspirational scientists looked as sad and stressed as she felt. Her adrenalin was spiked, but she couldn’t remember what she’d dreamed about. She lay awake with her covers coiled around her fists, which gave her plenty of time to obsess about Cindy. By four am, she decided that the whole bird incident had been a partial hallucination, mixed with sunlight reflection. She wasn’t even sure Cindy had a canary. She’d have to check that. Eventually she gave up on sleeping and clicked on her desk lamp. An hour with an abnormal psychology book helped her drift off. She hadn’t set an alarm, but she woke up with a start at seven the next morning. Her brain was a sludge of exhaustion, but she couldn’t fall back to sleep. After she dressed she spent an uncomfortable breakfast wincing under Alice’s chipperness and Dad pretending he hadn’t yelled at her at dinner the night before. Alice made her lunch and then left with Dad. Dad paused out in the driveway, looking at the Bauteil’s house and shaking his head. She sometimes worried about leaving Dad alone with Alice in the car, but none of the hypothetical attempts had happened in public. Dad had early shift at the grocery store and would drop Alice off at the hair salon on his way. They’d only be together for fifteen minutes. Once they were gone, Miranda stood at the end of the driveway, glancing at the juniper bushes and wishing she were hiding in them. While she waited for the bus, she watched the Bauteil’s house. Cindy passed her window a few times, brushing her hair. How could someone with five dads be so boring? One of the Bauteil dads walked by the front window. Probably Tom-Dad. Then Bill-Dad passed, then another dad. The Bauteil’s garage door rumbled and slid up. Their one car, a 1989 Buick, edged down their driveway. Miranda idly wondered how six people got by with just one car. As usual, Bill-Dad was driving. He waved. Tom-Dad sat in the passenger seat, distracted with something in the glove compartment. She waved back, genuinely smiling. It was just nice to have someone who wasn’t mad at her. Bill-Dad was always the most outgoing of the dads. Cindy waved from the backseat. Miranda kept waving; too long, probably. She blushed and forced herself to stop. The car made a little squeak as it stopped. Bill-dad’s head bobbed as he said something to Cindy. The reverse lights blinked on. When the car stopped in front of Miranda, he motioned to Tom-Dad. He looked up, saw Miranda and rolled his window down. He didn’t look like someone who would turn into a bird. He didn’t look anything like a bird. He and Bill-Dad just looked like … dads. The bus hadn’t come yet, but she found herself nodding, which was sort of like a lie, but she hadn’t said anything. It was possible she’d missed it. A bunch of Dad’s rules ran through Miranda’s mind; they all pretty much added up to “stranger danger” and “you can never trust anyone.” Not to mention, “Stay away from the Bauteils.” She imagined Cindy being the bait for a ring of slavers. She smiled and shook her head. That was ridiculous. If ever there was a chance to figure out the Bauteil’s, this was it. “I’d like a ride.” Which was not a lie. The kids on the bus were always yelling and changing seats. It’s too bad she didn’t have a ride like this every day, she’d have more time to get home and check on Alice. Bill-dad had a great smile too. “Hop on in.” It’d been a long time since her own dad had smiled like that. Tom-Dad twisted around and pulled up the backseat door lock. Once inside, Miranda threw her bag on the seat next to Cindy and buckled the seat belt. Her head snapped back when Bill-Dad zoomed off. She thought about quoting the speeding laws, but she kept her mouth shut. The rode in silence for a bit, while Miranda tried to think of something to say. Cindy giggled. It was a melodious giggle, and Miranda smiled in spite of herself. Normally when people laughed she assumed they were laughing at her, but that was hard to imagine right now. She said, “Cindy doesn’t talk much.” That was probably not a socially appropriate thing to say. Miranda was becoming aware of how much she was talking about Cindy, rather than to her. But she couldn’t think of anything to say. She looked out the window. They passed the giant oak tree in the Emmons’ front yard. The fallen leaves around it formed a nearly perfect heart pattern. Someone must have raked them that way. It seemed unlikely to happen naturally. Miranda felt her heart speed up. Cindy knew she’d been spying on her. 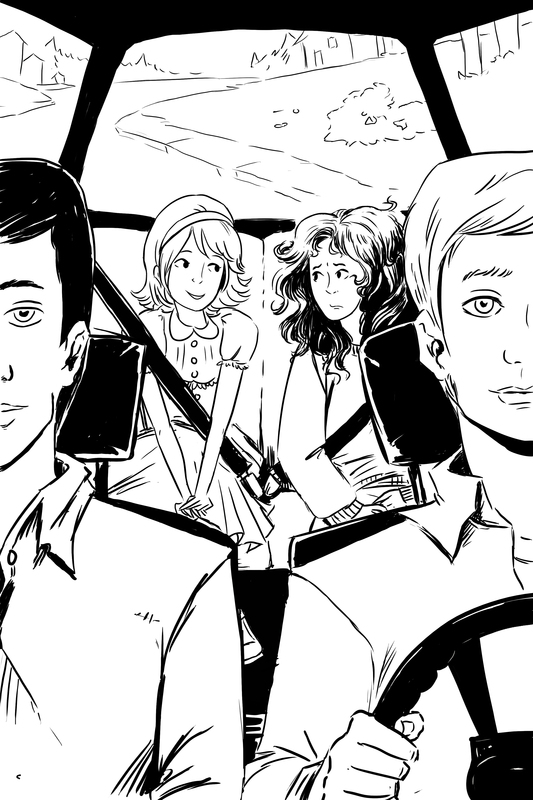 Miranda looked at Cindy’s dad, but he just smiled and kept driving. A good investigator would have a cover story ready for such a situation. All Miranda could do was prattle off, “Oh yes, stargazing is really interesting. I could recommend telescopes to you. I mean, I made my own, but it’s based on a Scientific American model.” She stopped herself there. When she talked too much about things she was excited about, people’s eyes started to glaze over. That’d be cool. Miranda didn’t say anything, but she smiled out the window. This must be what making friends was like. Her smile faded. There was no way Dad would let her bring a friend over, especially Cindy Bauteil. Bill-dad nodded. Tom-dad looked out the window. Bill-dad looked at her a moment, then shrugged. An important motive that is apparently inborn or learned early without formal training is curiosity. As early as 1881 it was observed that monkeys would tirelessly investigate their surroundings and manipulate any new object, although no reward was to be gained except the sheer fun of it. One monkey worked for two hours (unsuccessfully) trying to open the lock of a trunk in which nuts were stored, although a plentiful supply of nuts was within easy reach (Romanes, 1881). Thorndike (1901) reported the case of a monkey who repeatedly struck a projecting wire, apparently just to make it vibrate. Thorndike states, “He did not, could not, eat, make love to or get preliminary practice for the serious battles of life out of that sound. But it did give him mental food, mental exercise. Monkeys seems to enjoy strange places; they……like to have feelings (as much) as they do to make movements. The fact of mental life is to them its own reward.” But after this early work psychologists neglected the study of curiosity, and a period of over forty years passed before systematic investigation of curiosity were resumed.